Testing PICO Projector: Fantastic Results in My Pocket! Presenting at a Meetup is a whole lot of fun. Really, it is! Part of the fun, I discovered, is getting to use great gadgets. Unfortunately, in the process of seeking out a venue for my local WordPress Meetup group to meet and present comfortably I learned that there can also be quite a cost to use the gadgetry. Thankfully the Hartford public library downtown has really great spaces for meetups like ours. Downside is a $25 charge per use of their projector setup. Boo! So, with a special thanks to Lisa Comstock, of the Middletown WordPress Meetup, I got searching for some gadgetry of my own. It would have to be portable, first and foremost. It also had to be effective. Laptops are prevalent in geek-groups like ours, so there would have to be a good alternative to popping open a laptop or tablet and gathering ’round. Thirdly, it had to be affordable. Meetups are a labor of love, and budget-ability staves off bitter resentment of the effort. It wasn’t difficult to find this little gem of a projector. Searching “small projector” or even “cheap projector” results in all sorts of versions of PICOs. I read up on reviews in numerous sources and I’ll admit I was baffled by how inexpensive these little buggers are while maintaining satisfied reviews. So, I dared to give it a go! 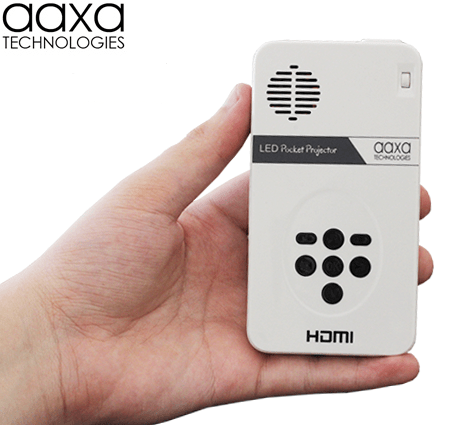 The model I chose, LED PICO Pocket Projector, I believe- is the least expensive model they offer, and is rated just 25 lumens. 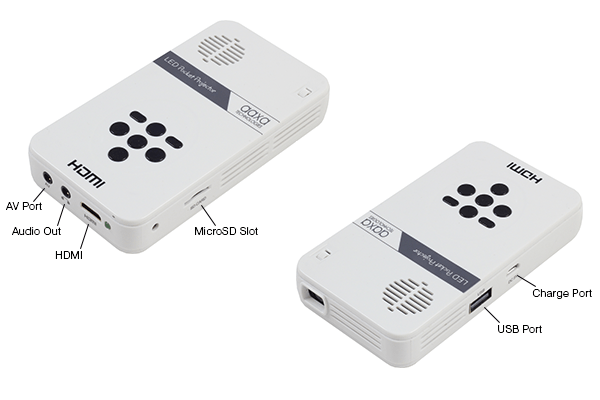 But on the perk side, it allows use through mini SD Card, Mini HDMI or standard USB flash drive. On receiving it I couldn’t wait to try out every option. Sadly, I had not realized until trying it that it required a mini HDMI cable to be able to present from a computer, so I had to wait a bit longer to play, until I received the cable I ordered. USB and SD card functions allow you to store JPGs to view. Yeah, cool if you like that sort of thing, but that was just not my cup of tea. I imagine a few years ago that might have drawn me in for family gatherings- but nope, I was only looking for a great Keynote or Powerpoint presentation tool – and prepping JPGS doesn’t do anything for my inner-geek. Anywhoo, long story short: I’m itching to present with this lil geek toy! It turns on and off in a heartbeat, great focus ability whether in my hand or on a tripod. Reviewers often said they found it to be noisy, but its quieter than the PS3; so I have no complaints there. Drawback: It cannot charge while in use, so remember to fully charge before the big day! Consider speaking at an upcoming WordPress Hartford Meetup and we’ll set you up. Go for it! Pick a topic you are confident in, pick a month you’re interested in presenting in and let me know!